Having a bad day? Party just a little too hard? You need some comfort food to soothe your weary soul. Mecha Noodle Bar on Washington Street in South Norwalk offers Southeast Asian comfort food that is sure to cure what ails ya. 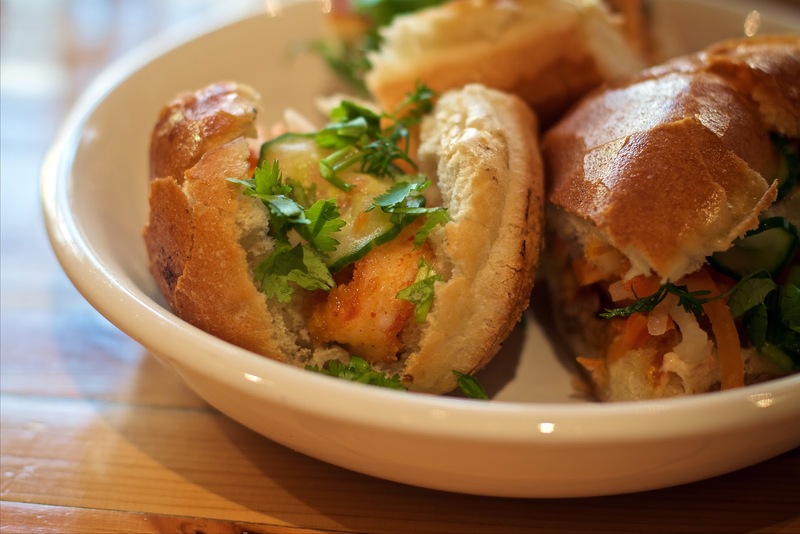 Mecha is the brainchild of Danbury-based longtime friends Tony Pham and Richard Reyes, and Richard's brother Juan. These young restaurateurs wanted to introduce the fresh flavors of Southeast Asian comfort foods to the Fairfield County area. They put their own twist on classics and offer it up in a chill, unpresuming setting. They opened first in Fairfield in 2013, just recently adding the second location in South Norwalk in the former Pasta Nostra spot on Washington Street. We are long time fans of Tony's Danbury-based restaurant Pho Vietnam, so when they invited us to check out what they have going on at Mecha we were all in. The look of the restaurant has a working man's vibe. Unfinished wood two by fours adorn the walls and hang from the ceiling. As you enter, to the left is a long, winding countertop bar with aluminum stools. Stationed on top of the bar are all your noodle bar accouterment - chopsticks, hot sauce, napkins. In the middle of the room are sit-down tables and a long communal table with stools. The waitstaff wears carpenter style aprons. It's fun without being kitschy. When possible, they source some ingredients locally. They are frequent customers of Holbrook Farm in Bethel as well as Farmer's Cow. 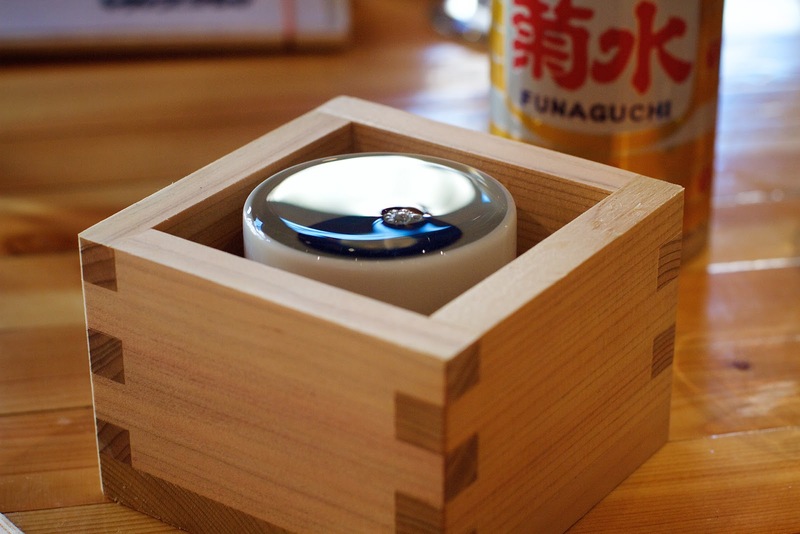 At Mecha SoNo, you'll find beer, wine and, yes, sake on tap. There's a full bar complete with interesting varieties of sake, as well as specialty cocktail menu. As for non-alcoholic choices they offer bubble teas, Thai iced tea, house sodas, and tea. 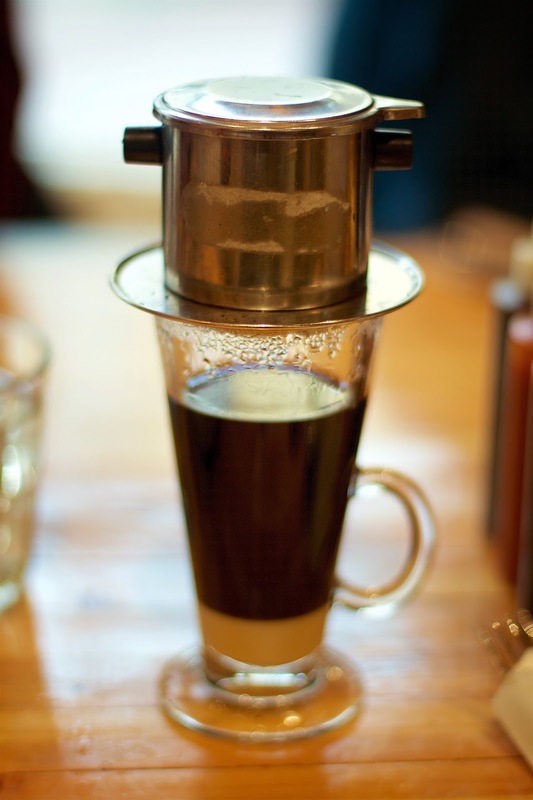 They also have American-style coffee and Vietnamese style coffee, both brewed with beans from Shearwater Coffee Roasters. By the way, the house liquor is shochu. We highly recommend doing a round of shots with friends. The bartender walked us through the ritual. You never pour your own shot. Hold the disc-like ceramic shot cup in your left hand with your finger covering a small hole in the bottom. Look your drinking companions in the eye, say Kampai, and then down the hatch. 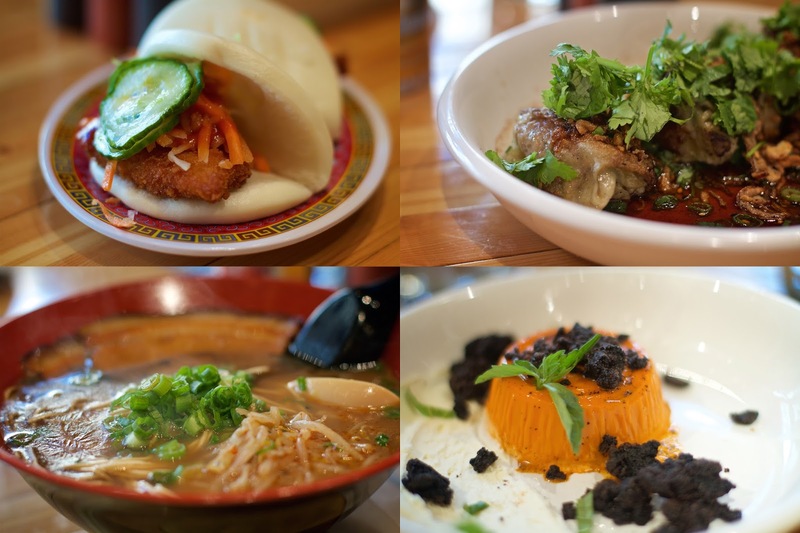 The menu at the SoNo location includes Baos, Snacks, Pho, and Ramen. (And just so you know, the Fairfield location has a bit more of an expanded menu.) We, of course, had to sample something from every category ... and then some. We had already heard great things about the KFC (Koren Fried Chicken) with gochujang, pickled daikon + carrots, and kewpie. It did not disappoint. 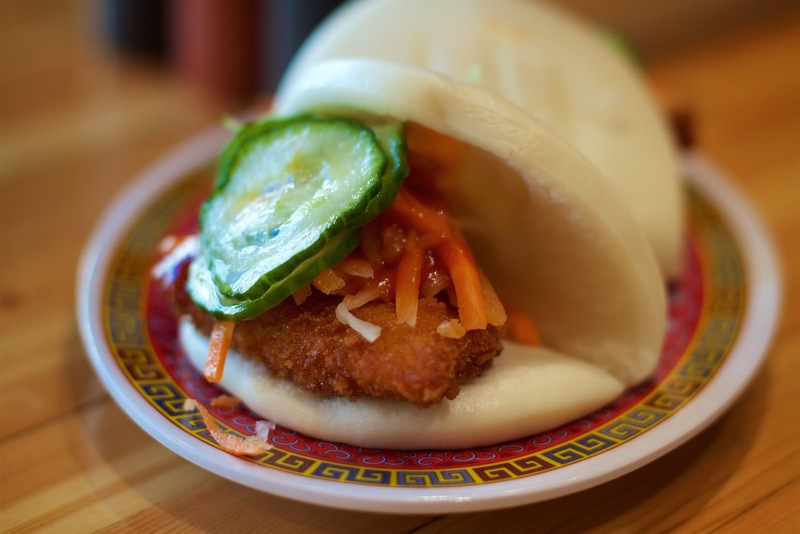 The light and fluffy bun was the perfect delivery vehicle for the tangy veggies and seriously crunchy but not dry chicken. 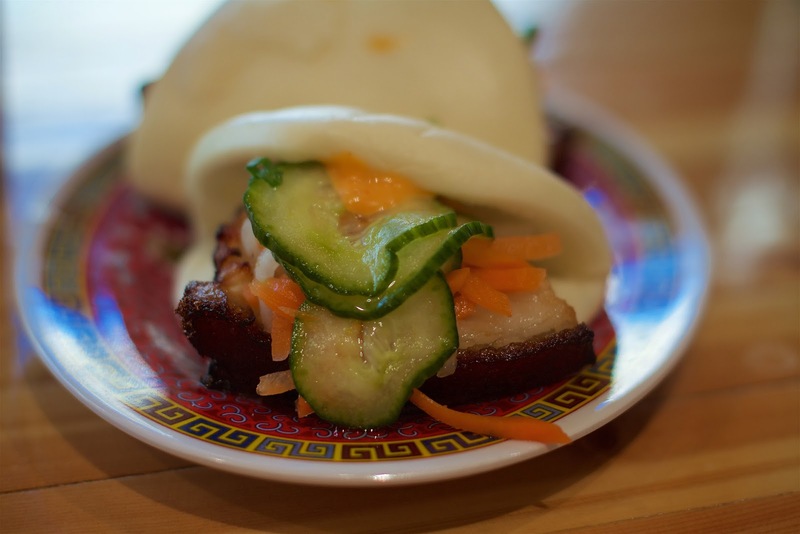 Of course, we had to also try the Pork Belly with hoisin, pickled daikon + carrots and kewpie. Soo good. The pork belly was gently crispy on the edges but then melted in your mouth. Fatty goodness all the way. Whenever I see a dish with pork and spicy in the description I'm in. 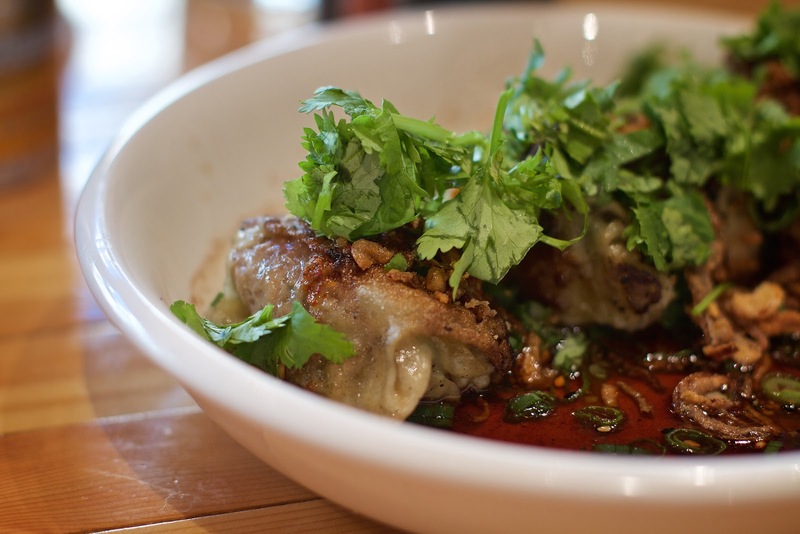 So it's really no surprise that the Red Oil Dumplings with pork, shrimp, Sichuan vinegar and cilantro was one of my favorites from our lunch at Mecha. It was a perfect blend of porky, tangy and spicy. The fried onion slivers on top just knocked it out of the park. I will definitely be ordering them again. 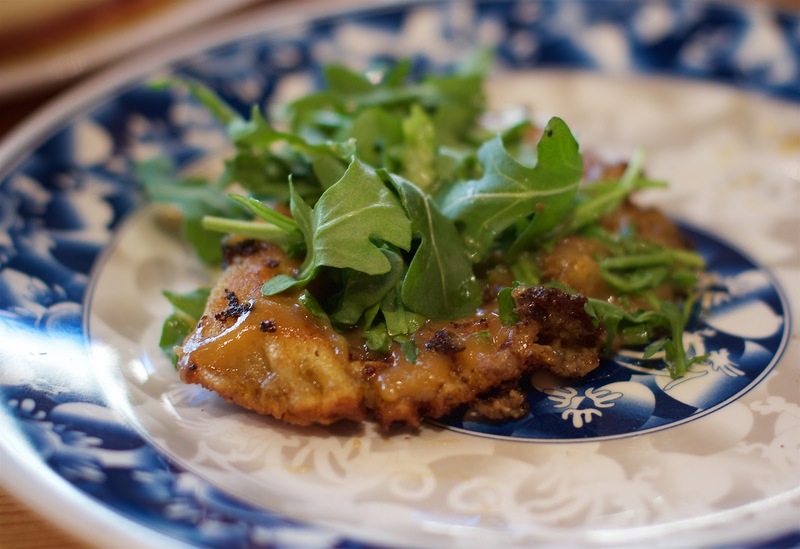 Renato enjoyed the Roasted Mushroom Dumplings with brown butter miso and arugula. He insisted I try them. I liked the brown butter miso; for me, it helped disguise the mushroomyness. They were definitely mushroomy. The Fried Shrimp Bahn Mi with shrimp pâté, cilantro, dill, pickles was good but wasn't my favorite. While it had a wonderful fresh shrimp flavor, it was a little bready for my taste. 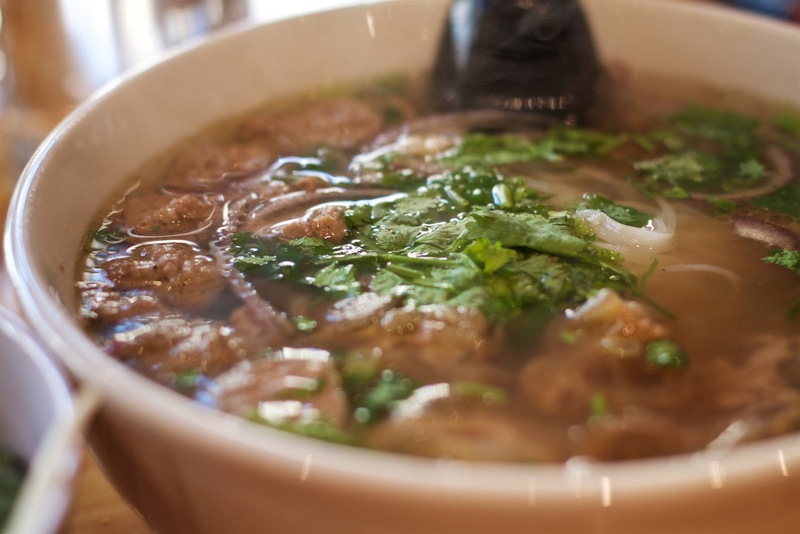 Pho Bo Vien featuring rare beef, beef meatballs, and Renato also added on some tendon. The soup is hearty yet light enough where you don't feel overly full after eating the entire bowl. The beef and tendon were tender, the broth was flavorful. So, okay, hold on to your seat because this was my first time having real ramen. Hard to believe I know. So needless to say, I was excited to finally dig in. I went for the Tonkotsu pork ramen with chashu, spicy sprouts, egg, and scallion. The broth for the tonkotsu is simmered for 14 hours and you can tell. The flavor is deep and rich. I thought the dish was a bit salty, but that didn't stop me from slurping it up. It was a great play of textures and flavors. And, we just had to finish off our amazing lunch with a touch of sweet. 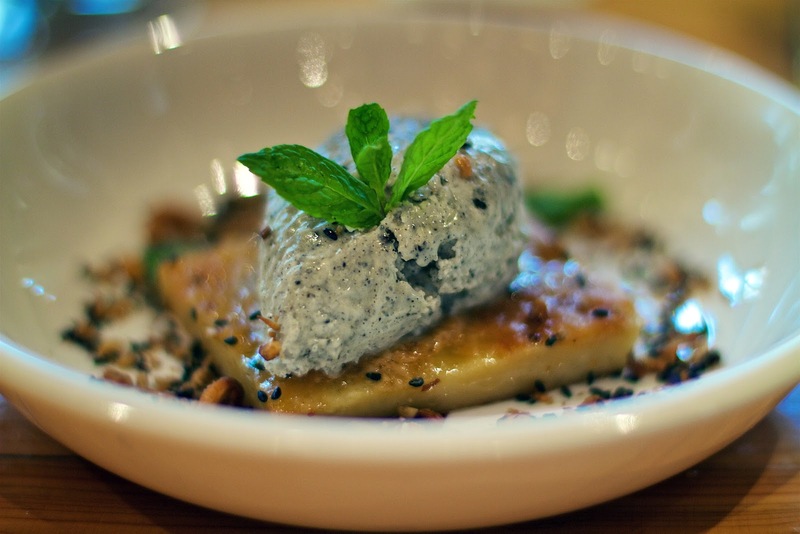 We had the Thai Iced Tea Panna Cotta with lemon mascarpone and salted Oreo crumbles and a piece of Mochi rice cake served warm with sesame buttercream, black sesame, mint and toasted peanuts. The panna cotta was a light palate cleanser but the Mochi stole the show. Oh, that hunk of frosting! Not too sweet with a fantastic nutty flavor. This is my kind of dessert. 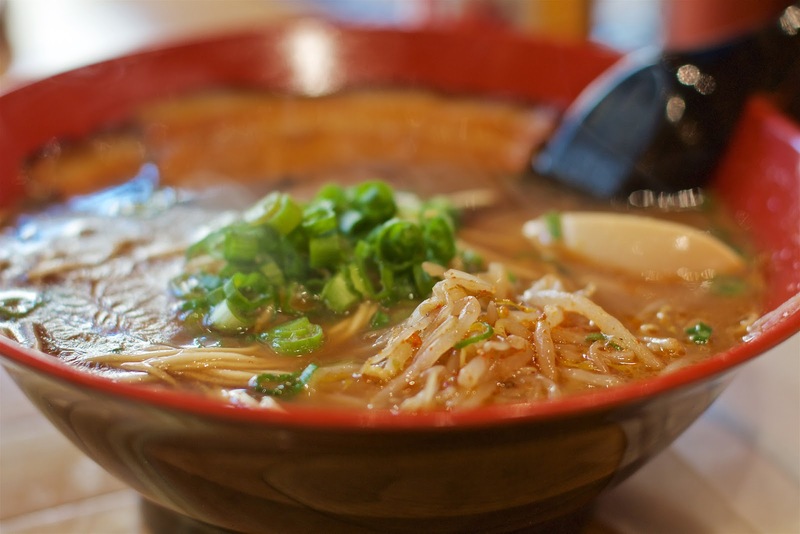 We think you should definitely hit up Mecha Noodle Bar. The prices seem incredibly reasonable and we found the portions are more than filling. 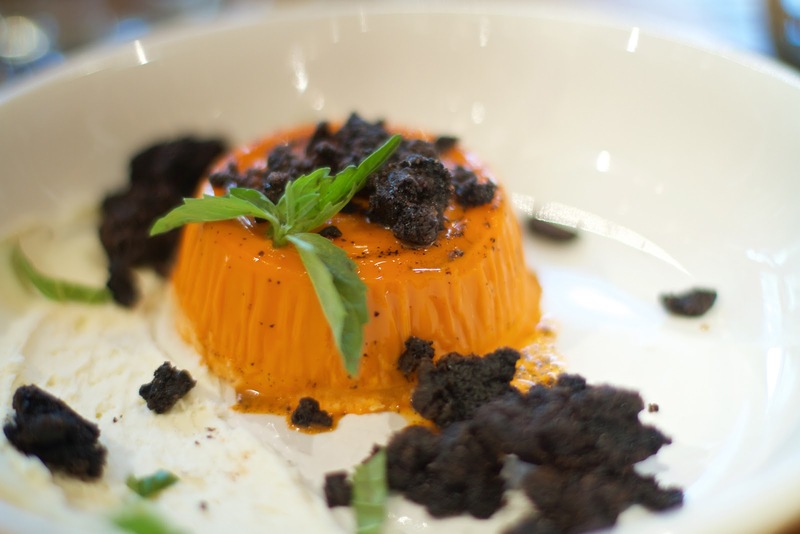 Your taste buds and maybe your weary soul will thank you. Disclaimer: We were not compensated for this post. The meal was free of charge. The opinions contained herein are our own and reflect our experience. Your own may differ. This post is making me drool!! Everything looks amazing! Can you believe I have never had Pho!!! Can't wait to try it now! Thanks! I think you'll love it. Looking at the pictures makes me hungry! I must go back there soon. Thanks. We can't wait to go back too. LOVE Mecha. I get the red oil dumplings every time I go. Still have to try the sono location. Those red oil dumplings are a must! Thanks Denise! Today's snow especially has me craving their food too.